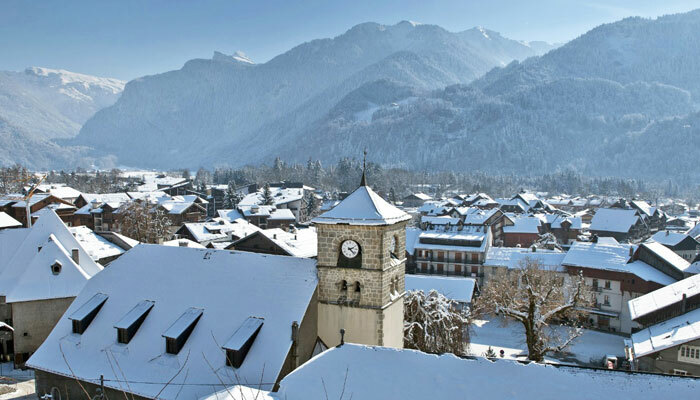 Set amid forest and nestling at the foot of the imposing Criou mountain, Samoens has remained unspoilt by tourist developments and is the only resort in France to be listed as a ‘Land of Art and History’. Despite recent growth on the outskirts, the many traditional-style bars and restaurants still give a feel for the ‘real’ rural France. Labelled as a ‘Famille Plus Montagne’ resort it is also an ideal family destination. Non-ski activities include dog-sledding, indoor climbing and skating but also some more unusual activities such as archery in the forest, caving, ice climbing or diving under ice! 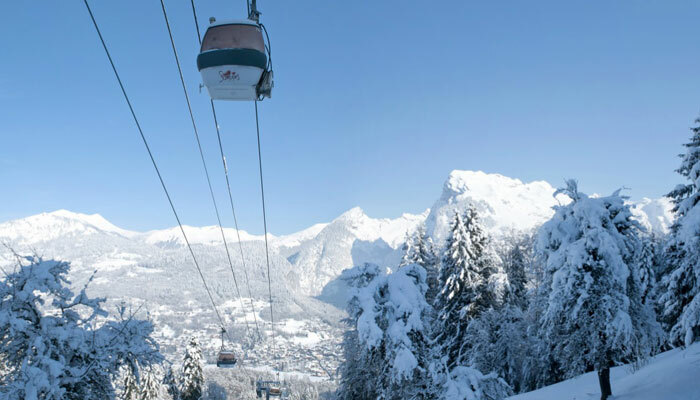 The resort is linked to the massive Grand Massif (with Les Carroz, Morillon and Flaine) and provides extensive skiing for all levels with virtually no queues. Not many places offer such a wide variety of skiing, and very few have such fantastic panoramic views over Mont-Blanc. There is an excellent nursery slope area at Samoens 1600, in fact now the biggest beginners’ area in the Haute Savoie. For the more advanced there is also a testing terrain: The steep north-facing mogul slopes from the Tête des Saix, the central point of the entire Grand Massif system, down to Samoëns are particularly enjoyable. Intermediate and more advanced skiers and boarders will enjoy the 49 red pistes and 12 black pistes of the Grand Massif. There is a new fast (8 mins), high capacity gondola from the village to a new extensive beginners area on the plateau at 1600m, which also acts as a gateway to the Flaine ski area. 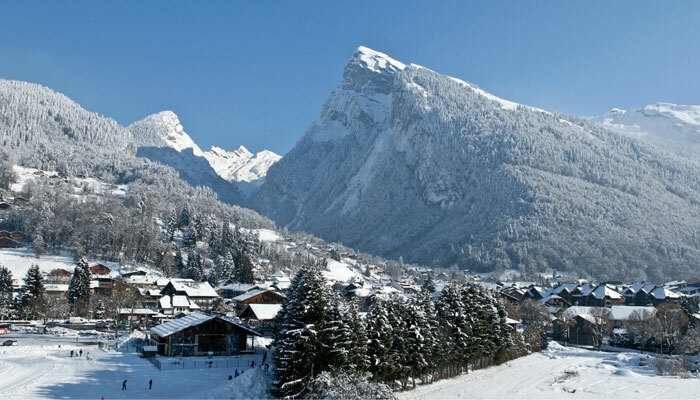 Skiing in Samoens is very easy, with a brilliant nursery slope area at Samoens 1600 for beginners to practice on, with an array of lifts and magic carpet to get children to the top of the slopes for the kindergarten. This area is separated from other slopes to enable complete safety and avoid having skiers with different levels of experience sharing the same pistes. Intermediates and boarders will enjoy the 49 red pistes and 15 black pistes they’ll find on the Grand Massif’s extensive intermediate slopes and big lift networks. There’s also more testing terrain for the more advanced: the steep north-facing mogul slopes from the Tête des Saix – the central point of the entire Grand Massif system – down to Samoëns are particularly enjoyable. There’s also extensive off-piste. Cross-country skiing is a gentle way of discovering the natural environment. At Joux Plane, situated at an altitude of 1700 metres (30km of slopes), dominating the valley of the Haut Giffre (60km of slopes) and facing Mont-Blanc, this activity is guaranteed from November to April. It is also possible to go tobogganing here, or walking on specially prepared tracks using snowshoes, or on circular walks. Shuttle buses run between Samoens and the Col de Joux Plane.